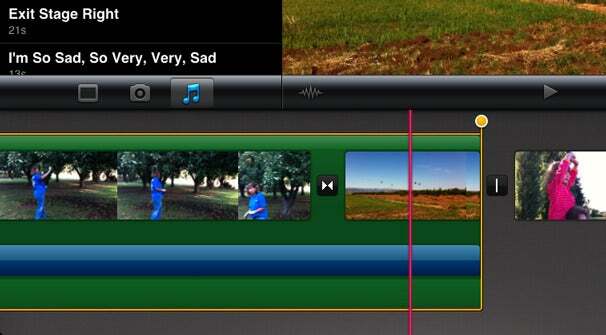 iMovie for iOS is an amazing video editor for the iPhone, iPad, and iPod touch. Its ability to work with audio, however, is quite limited—but the limitations aren’t impossible to overcome, especially with a little creativity. Here are a trio of issues and workarounds to improve the audio in your mobile movie projects. Problem: The song list in iMovie’s Audio pane is tedious to navigate. Each built-in project theme has its own custom background music, but you may want to pick something from your own music library. If your collection is sizable, it can take a while to sort through the songs, especially since any tracks that still contain Apple’s FairPlay DRM appear in gray text with “(Unavailable)” appended. Expect a lot of scrolling in iMovie’s song list. Also, when I’m editing in iMovie ’11 on the Mac, I frequently like to sort the song list by time so, for example, I can easily find a song that’s two minutes long. The solution is to create Smart Playlists in iTunes and use them to your advantage. Here’s an example of one that lists songs under two minutes in length and ignores those with DRM. In iTunes, choose File -> New Smart Playlist (or press Command-Option-N). Click the plus button (+) to add a new selector. Add a third selector, specifying "Kind" "does not contain" and then type the word "Protected" in the text field. Set the Match option at the top of the window to "All". Click OK and give the Smart Playlist a name. To make sure your new Smart Playlist appears on the iOS device, select the name of the device in the iTunes sidebar, click the Music button at the top of the screen, and mark the checkbox next to the Smart Playlist in the Playlists pane. Then, click the Apply or Sync button to perform a sync operation. An iTunes Smart Playlist narrows the song list considerably. 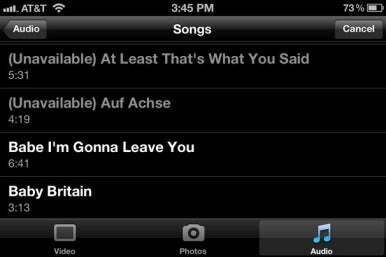 The next time you access the music library in iMovie for iOS, tap Playlists and then tap the playlist you created. Naturally, you can set regular and Smart Playlists for anything you choose: chase music, ambient tunes (iMovie doesn’t offer a way to view tracks by genre, so you could create Smart Playlists for different genres), and more. Problem: There are a limited number of sound effects. In the Finder, navigate to /Library/Audio/Apple Loops/Apple/iLife Sound Effects or /Apple Loops for GarageBand to locate other audio files. (That’s the Library folder at the root level of your hard disk, not the Library folder that appears in your Home folder.) The files are in Core Audio Format (.caf), which iTunes doesn't play, so you'll need to do a quick conversion. Select a file and press the spacebar to preview the song using Quick Look. When you've found a song to use, Control-click it and choose Open With -> QuickTime Player from the contextual menu that appears. In QuickTime Player, choose File -> Export and save the file to your hard disk. Open iTunes, and choose File -> Add to Library to locate and add the exported .m4a file to your iTunes library. Sync the iOS device to include the audio file. Problem: Can’t use a track shorter than 60 seconds as a background song. iMovie assumes that anything shorter than a minute is a sound effect, not a background song, which isn’t helpful if you want to start your movie with a short piece of music. If you start with a short piece of music and then add a longer audio file, the two will overlap: iMovie treats audio tracks longer than 60 seconds as a background songs and automatically places them at the beginning of the movie. Tap the Project Settings button (the gear icon). Turn off the Theme Music and Loop Background Music options if they're on. To exit the popover, tap the Gear icon again on the iPad, or tap Done on an iPhone or iPod touch. Go to the Media Bin and add a background song (anything over 1 minute, such as any of the Theme Music selections). Double-tap the green background song on the timeline to bring up the Audio Clip Settings. Tap the On/Off switch to Off to mute the clip. Mute the background clip so it acts only as a placeholder. Add the short song (under 60 seconds) you want from the Media Bin as a sound effect (it appears blue), and position it in the timeline where you want it to appear. Tap the green background clip to reveal its selection handles, and drag the end handle to trim the muted song down to the duration of the blue clip. Now, you can add any regular background (i.e., longer than 60 seconds) song to the timeline and have it start to play after your short song. 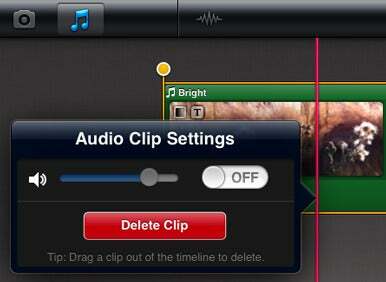 Trim the background song to the length of the shorter clip. These workarounds don’t solve all of iMovie’s audio ills—I’m eagerly awaiting a control that fades a clip at the end of its edit point, instead of cutting songs off abruptly—but they do go a long way toward making the process of working with audio easier.